With all the rain and sleet and snow in our midst, we might just be in need of some quintessential comfort food. If you enjoy custard and fruit, I combine them here in a way that is so pure in flavor and luscious in texture that I think you will find this completely irresistible. Pot de crème is usually a looser custard than crème brulée. The name refers both to the dessert and to the elaborate lidded porcelain cups in which they are baked, originating all the way back to the 18th century. Nowadays, ramekins serve the same purpose. 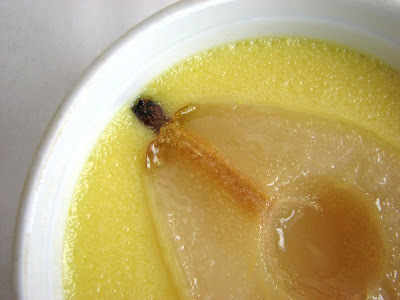 For this version, I first poach pears in an unfussy vanilla syrup to a very tender melt-in-your mouth texture. 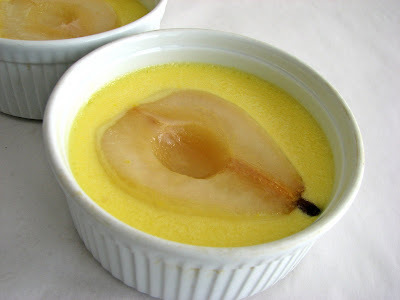 Each pear half is placed in a plain vanilla custard base that is baked to crazy creamy perfection. The combination of tender slightly sweet fruit and freshly baked sumptuous custard is the height of what a warm wintry dessert should be. This is definitely not rocket science. All that’s missing is a crackling fire and a good book. But no need to wait for a dreary day. Pear Pots de Crème really deliver come rain or come shine. - Whenever you are whisking together egg yolks and sugar, be sure you use them within a very few minutes. Letting them sit for more than a few minutes will “burn” the yolks and you'll wind up with a hardened clump of eggy protein. - I used some very nice D’Anjou pears and they were perfect. - Figuring out when custard is done takes some practice. With this recipe, the edges will look firm but the center around the pear half will be fairly jiggly. The 35 – 45 minute range is given because all ovens are different and the temperature of the water bath affects the baking time. So keep checking after about 30 minutes, gently jiggling a ramekin to get a sense of how it's coming along. I don’t cover the custards with foil here because I think that makes it easier to overbake them. - I like the super creamy melt-in-your-mouth texture of both fruit and custard, so I think this is best when served fairly warm, which means the custard is pretty loose. 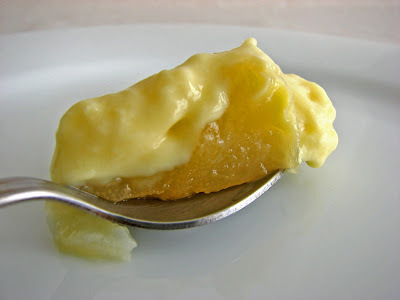 If you’d like a custard that is more set, refrigerate for a few hours and it will thicken up. Bring to room temperature to serve. Bring the sugar, water, lemon juice and vanilla bean to a low simmer. Peel, slice in half and core the pears, placing in the poaching liquid as you go. Simmer for about 10 - 15 minutes (depending on ripeness), turning occasionally, until you can easily insert a knife into a pear without any resistance. Remove pears, drain on a piece of paper towel and pat dry. The poaching liquid can be discarded or reserved for another use. Once the pears are completely drained, slice a very thin piece off the rounded side of the pear so it will lie flat and place one half in each of four ramekins. Bring the cream, milk and vanilla bean to a slow simmer. Steep for about 20 minutes. Whisk the egg yolks and sugar until completely blended and the mixture is a pale yellow. Remove the vanilla bean and slowly add about 1/2 C of the warm cream and whisk vigorously. Slowly add the remaining cream and a pinch of salt and whisk until the mixture is thoroughly blended. If you are not using a vanilla bean, add the vanilla extract. Pour the custard carefully into the 4 ramekins, avoiding the top of the pear. Place the ramekins in a roasting pan. Bring a pot of water to a simmer. Place the ramekins and roasting pan in the oven and slowly pour the hot water into the roasting pan until it reaches about half way up the side of the ramekins. Bake for about 35 – 45 minutes or until the edges are firm but the center is still fairly jiggly. Remove from the water and let cool slightly. Serve warm if you prefer a loose custard. Refrigerate for a few hours if you prefer a firm custard. Bring to room temperature and serve. wow. this looks incredible. i never even thought about putting whole fruit in pots de creme. brilliant! This looks beautiful! I adore pears, so I'm sure this tastes amazing. pear yes, love this. you are so creative. What little works of art! 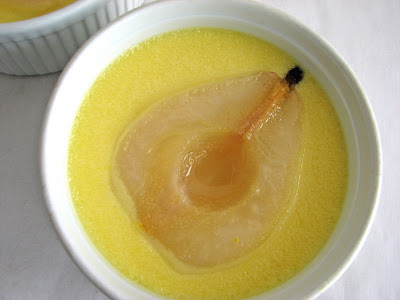 Poached pears would be such a perfect accompaniment, texture-wise, to pots de creme--great idea! These look gorgeous, great idea! Would you say these custards are "eggy" tasting? Hi nakedbeet - I don't think it tastes eggy but your palate may vary. Many other custards actually have a higher egg ratio but this is a very loose custard if baked properly. Hope you try it and enjoy it! What a lovely combination. I can just imagine the luxurious mouth-feel this has - and fabulous taste too. What a great idea! That looks like such a lovely dessert! These look beautiful! I just bought my first set of ramekins and have been looking for something to bake in them, how perfect!